Are Azaleas very sensitive to transplanting into a pot? A friend gave me an old Azalea that I dug up yesterday. I got plenty of roots and soil initially, but there was this bamboo plant entangled in the the Azaleas roots at the Azaleas base along with a lot of heavy clay. In the process of me attempting to remove this Bamboo root system from the Azaleas, I pretty much lost all the original soil, but then again, most of it was clay anyway. Should I leave a lot of the leaves for now? It was growing in this very shaded area and had become very lanky with not that many leaves to begin with. I planted it in this wooden box and plan on leaving it in the shade for several weeks until I see active growth, then I would introduce more sun gradually. I'm just wondering if Azaleas are very sensitive to this type of thing or did I just kill the poor thing..
Oh, I live on the coast in Alabama and the Azaleas are just starting to bloom, not that many yet, but they have started. I have clipped the buds off this plant. Re: Are Azaleas very sensitive to transplanting into a pot? You did the right thing. It's always good to wash the old soil from azalea roots especially when potting for the first time - and more so if that original soil is clay. Yes, remove buds this year and reduce the mass of the top to match what you took from the bottom as best you can. They are tough and forgiving. I'm in Mobile too, we have a good club and a fun event planned for this weekend. Do I know you? Russell Coker wrote: You did the right thing. It's always good to wash the old soil from azalea roots especially when potting for the first time - and more so if that original soil is clay. Yes, remove buds this year and reduce the mass of the top to match what you took from the bottom as best you can. They are tough and forgiving. Thanks Russell, I feel a little better about it now. I don't know anyone associated with Bonsai other than people I've posted with on forums, so no I don't know you. I thought about looking for a club to join but I'm too busy now and live to far out too..Maybe I will join up some day though. We'll be at St Luke's, corner of Azalea and Japonica (between Hwy 90 and Cottage Hill Rd) starting Saturday morning if you can get by. Lots of people from Louisiana, Mississippi and Florida, too. We have a really good local group, hope you can join us sometime. Bonsai is a lot easier when you're not alone. I don't mean to sound pushy but here goes. You may not know it but you are living very close to some of the most knowledgeable Bonsai people on the gulf coast. At least 4 members are considered to be masters. It would be to your benifit to become aquainted with them. Thats my humble oppinion. Wish I lived closer to them. I live in NE Ohio. No buds anywhere yet but it wont b long thankfully! 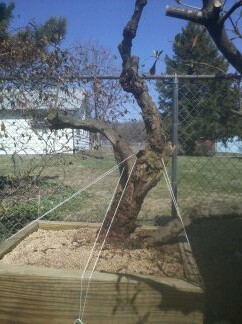 So I been bothering my dad to let me have a very old azalea with a huge hollow trunk for use as a bonsai. Finaly he agreed after some haggling. I plan to reduce root ball size and foliage mass this wknd and leave in place til nxt year. Would this b best or should I remove it from his gardens clay soil all in one go? You can try to cut roots using a spade while letting it develop new roots. I also suggest you cut back branches you want to remove until the last foliage. If you develop new growth below and around the branch you want to remove, it will help keeping the sap flow going. It is possible to prune all foliage from an azalea, as one could with a maple. But there's risks that are hard to estimate. Most azalea show very vigorous new growth. Few plants create so much new growth so easily. There are two ways to style an azalea. One is to bring out a tree like character like with most bonsai. Another is getting a good shape for showing off the flowers. Some azalea have open upright growth. Others have really compact and branchy growth. Many azalea grow more wide than high. You probably want a tree like azalea. Hopefully your azalea does not have a multi trunk shape but more likely than not they will have. Either way, you probably want to reduce to one trunk. Say you have a Y shape. I would cut back the trunk you want to remove to just a bit of foliage. Then also remove the larger branches from the other trunk, especially if they are high. You want to remove enough to get a lot of new growth. I would also work on the very long term. So at least you want to create taper that right now doesn't exist. Also, you want to heal the scar of the removed second trunk. When there is a lot of new growth around and especially below the severed second trunk, you can remove it to a stub. Then you want the new growth low on the azalea to develop into large branches that will fatten up the lower trunk and create taper. Even the trunk as a whole getting bigger will help to lessen the severity of the scar. But all that will make it take even longer for the tree to finish. 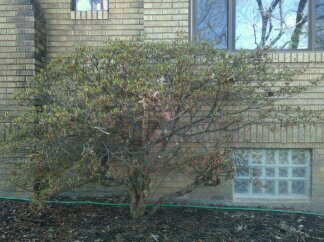 The azalea needs to be bigger after all the pruning than it is now for that to happen. Through all this I would keep the azalea in full ground, though you may consider replanting it to develop the roots properly as well. When the trunk is grown into the proper shape you want to remove all big old branches, dig it up and then you can put it in a pot. When putting an azalea in a bonsai pot you eventually want all the oil garden soil to be gone. In Japan people bare root their azaleas and literally remove every bit of soil. I have heard people, especially from California, comment that they believe that because their climate is much drying, it is a danger to the tree to do this. Alternative is to cut out pie pieces one by one over the time of several years until all old soil is gone. During all this time, removing the flower buds as soon as you can see them in late summer/autumn will help focus the tree's energy in growing. Removing flowers one they open or are about to open will not save energy. Azaleas don't have tap roots. Now let's wait and be amazed on how much new growth it puts out. 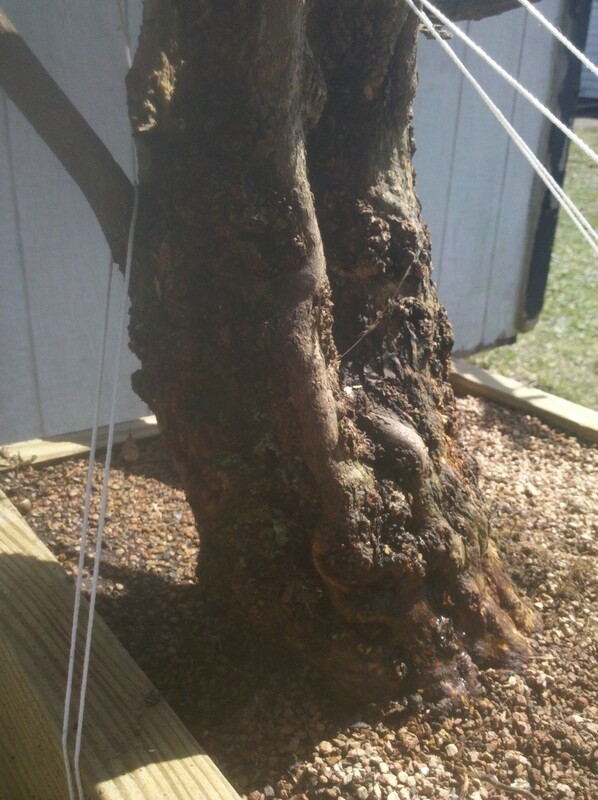 Main trunk being dead and hollow isn't a good thing, I guess.